Clinic Synopsis: Marine Band Director John Philip Sousa earned his famous moniker by perfecting the form and performance of the American march. But how are Sousa’s miniature masterpieces actually put together and what are the elements of performance that make his marches so special? Musicologist and Sousa scholar Dr. Patrick Warfield joins the U.S. Marine Band to explore Sousa’s remarkable development as a composer through performance of the different types of Sousa marches. The Marine Band’s unique performance practice of Sousa marches is modeled on those of “The March King” himself and many of the featured selections will be drawn from the Marine Band’s recording project, “The Complete Marches of John Philip Sousa.” This collection, with the latest volume scheduled for release on Dec. 12, is available free online, so bring your laptops, tablets, or smartphones to the clinic to download the edited full scores and follow along! 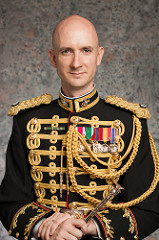 Clinician Biographical Information Lieutenant Colonel Jason K. Fettig is the 28th Director of “The President’s Own” United States Marine Band. He joined the Marine Band in 1997 as a clarinetist and soon became a frequently featured soloist with both the band and the Marine Chamber Orchestra. After serving four years in the organization, he was selected as an Assistant Director, and he conducted his first concert with the Marine Band Aug. 1, 2001. He was commissioned a first lieutenant in July 2002, promoted to captain in August 2003, and became the band’s Executive Officer the following year. He was promoted to major in August 2007 and to his present rank in July 2014 one week before assuming leadership of “The President’s Own.” As Director, Lt. Col. Fettig is the music adviser to the White House and regularly conducts the Marine Band at the Executive Mansion and at all Presidential Inaugurations. He also serves as music director of Washington, D.C.’s historic Gridiron Club, a position held by every Marine Band Director since John Philip Sousa. He frequently leads concerts throughout the Washington, D.C., area and across the country during the band’s annual national tour and live performances by the Marine Band under his direction and are often heard on National Public Radio. Lt. Col. Fettig is a fervent advocate for both traditional and contemporary American music and remains dedicated to the ongoing development of music for wind band. In recent years, he has conducted the world premières of substantial additions to the repertoire by James Stephenson, Jacob Bancks, David Rakowski, Adam Schoenberg, David Conte and Narong Prangcharoen. Throughout his career with the Marine Band, Lt. Col. Fettig has been deeply committed to music education and has taken an active role in the evolution and expansion of the many educational initiatives of “The President’s Own.” In addition to helping refine the Music in the Schools and Music in the High Schools programs, he has made it a priority to maintain a significant presence in schools throughout the nation during the band’s national concert tours. He also began an interactive and theatrical Young People’s Concert series in 2006 and authored, hosted, and conducted this popular annual event until 2015. In 2014, shortly after assuming command of the Marine Band, Lt. Col. Fettig launched an ambitious project to re-record all of the marches of John Philip Sousa and provide free performance and educational materials online to schools throughout the world. Lt. Col. Fettig is a 1993 graduate of Manchester Central High School in New Hampshire and holds two bachelor’s degrees from the University of Massachusetts, Amherst (UMASS) in both clarinet performance (1997) and music education with an emphasis in conducting (1998). In 2005, he earned a master’s degree in orchestral conducting at the University of Maryland, College Park (UMD), where he served as assistant conductor for two productions of the Maryland Opera Studio. He studied clarinet with Michael Sussman and David Martins, and his principal conducting teachers were Malcolm W. Rowell and James Ross. Additionally, Lt. Col. Fettig has participated in workshops with several renowned conductors including Osmo Vänskä and Otto Werner Mueller. Lt. Col. Fettig has represented the Marine Band on numerous occasions as a soloist, adjudicator, and clinician, and regularly conducts both concert bands and orchestras for all-state and honor festivals. In 2014, he was elected as a member of the prestigious American Bandmasters Association. The Marine Band is America’s oldest continuously active professional musical organization. Founded in 1798, the band has performed for every U.S. president since John Adams. Known as “The President’s Own” since the days of Thomas Jefferson, the Marine Band’s mission is to provide music for the President of the United States and the Commandant of the Marine Corps. Second Clinician Biographical Information Patrick Warfield is a specialist in American musical culture. His current research focuses on music in Washington, D.C. during the late nineteenth and early twentieth centuries, with a special interest in the American wind band tradition. Dr. Warfield has presented at conferences and meetings of the American Musicological Society, the Society for American Music, the Gesellschaft zur Erforschung und Förderung der Blasmusik, and the Nineteenth-Century Studies Association. He has delivered keynote addresses at the North American British Music Studies Association and the Frederick Loewe Symposium on American Music, and has served as a speaker at the International Conference on Nineteenth-Century Music and the annual American Band History Conference. His publications have appeared in The Journal of the American Musicological Society, American Music, The Journal of the Society for American Music, and Nineteenth-Century Music Review. He recently completed the edition Six Marches by John Philip Sousa for the series Music of the United States of America and a biography of Sousa, entitled Making the March King, published by the University of Illinois Press. Dr. Warfield was a founding member of the editorial board of The Journal of Music History Pedagogy, and is especially interested in the teaching of American popular music, including rock, jazz, and the blues. 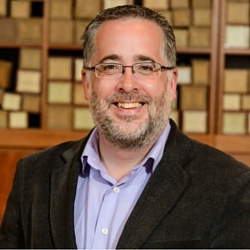 He is also active as a public musicologist, delivering programs for the Music Center at Strathmore, the Washington National Opera, and the Smithsonian. In addition to his position in the School of Music, Dr. Warfield is an affiliate faculty member in the departments of American Studies and African American Studies.